A mother brings her 7 month old son to the Emergency Department, as he has been irritable for the last 2 days. There have been no major problems, apart from the irritability, that she can pinpoint, perhaps some slight feeding issues and some fever two days ago, but that is all. The local doctor had been consulted two days prior and had commenced the child on antibiotics for an ear infection. Today his mother has also noticed that he has intermittent wheeze and so has come to the emergency department. Resident: “This is a relatively well looking child…..yada yada …..”. The case sounds straightforward, perhaps some bronchiolitis. Nothing much is jumping out. No sounds are heard. Now this is a good Resident. She works hard and is eager to learn, so I want to push her. This, in fact, would end up being a perfect case for her to learn from. I send her back to get the rest of the vitals and re-present. Resident: “I couldn’t measure the heart rate properly because it was too fast, but I think it was around 150”. RED FLAG SHOULD BE POPPING UP IN EVERYONE’S HEAD AT THIS POINT IN TIME! I have a little rule when I’m working, that says, trust no-one, believe nothing, until you see it yourself. This comes from working in Emergency Medicine for a long time and hearing stories, that are nothing like what is going on, when I see the patient. In the department I was locuming in on this day, there is a myself and and intern and a resident, i.e.., a first year and a second year, on duty to see the patients coming into the department. It exposes everybody, and in my book, means that the consultant must see every patient, which is not always possible. This is a narrow complex tachycardia. I can’t really see P waves, so it’s an SVT. An ECG confirms this. Always get the vitals and know what they mean. Do they make sense? Do you know what the normal vitals are for the different age groups? It isn’t always easy to remember. In infants, if they aren’t quite right and you’ve gone over the examination and applied my “SIC KID” mnemonic from EMCORE and still you’re unsure, put the child on a monitor and make sure they aren’t in an arrhythmia. How Do Children With SVT Present? Infants in the early stages may present with poor feeding, irritability, tachypnoea, sweating, or lethargy, but this can progress to congestive cardiac failure (CCF). We are unsure how long the SVT had been going on for, in this child, but it may have been the whole 2 days that the child had been unwell for. The wheeze we were now hearing may have been a cardiac wheeze secondary to CCF, although the sats are 100%. Older children will be able to tell you they have palpitations. Older children also better tolerate these rhythms. In about 20% of cases in older children, there will be some congenital heart disease known. Sinus tachycardia will vary in rate significantly over time. The rate will go up and down over a period of time. In other words you are not seeing a snapshot. Watch the monitor and see what the rate does. Although SVT can vary it will tend to stay constant. 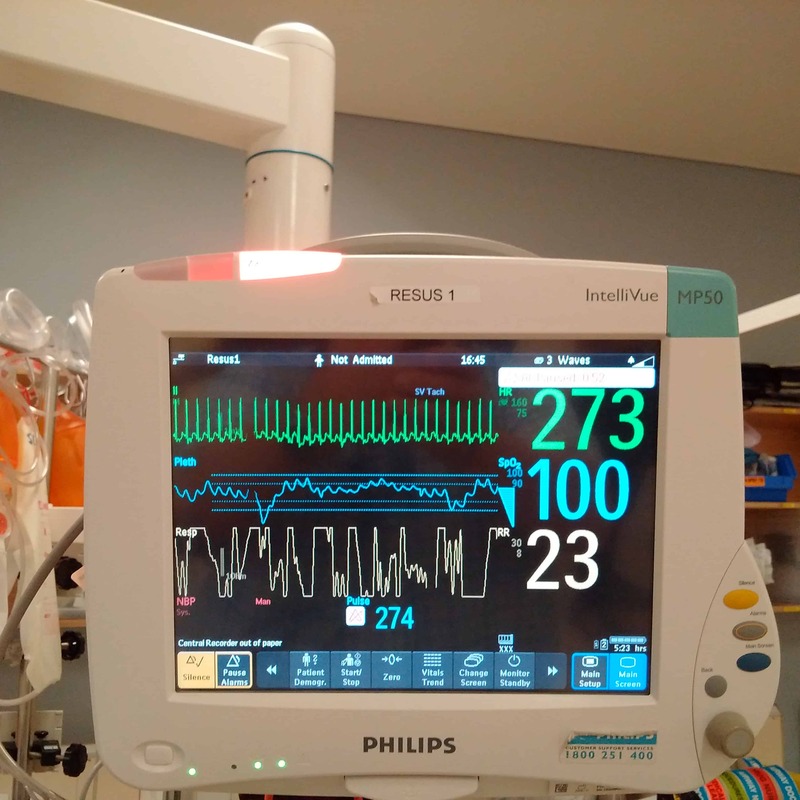 The rate itself is important, as sinus tachycardia will generally not be greater than 200 – 220 beats per minute. If the rate you are seeing is greater than 220 beats per minute, then think of SVT. Do an ECG and look for the P waves. If you can see P waves and they look normal, it’s sinus tachycardia. If you can’t see P waves, or if they have an abnormal axis ie. inverted for example, then it is probably SVT. How Do We Treat SVT? Is the child haemodynamically stable? If the child is not haemodynamically stable, give electricity. 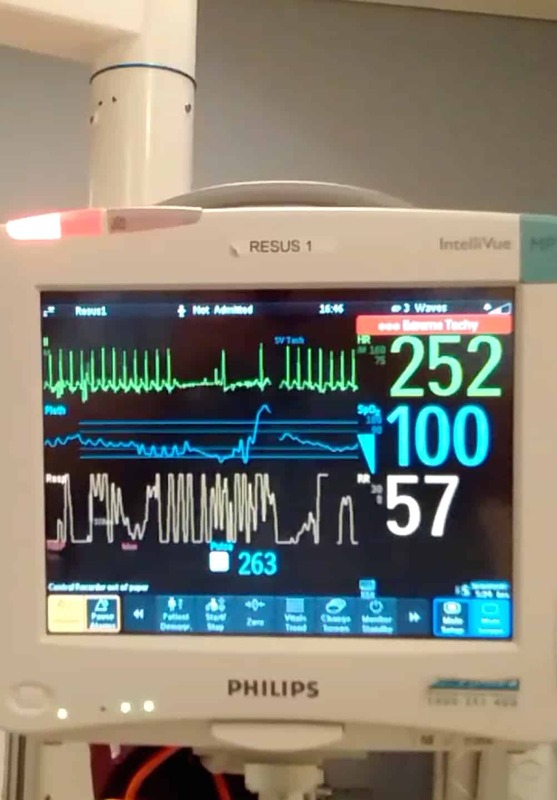 Synchronised DC cardioversion at 1J/KG. This can be increased to 2J/KG. In our case the infant was very stable and so we decided to embark on vagal manoeuvres first, with the knowledge that we could move on to medications if they were required. In infants a bag of ice placed on the face for up to 30 seconds should suffice. I don’t immerse infant’s faces in water. In toddlers a face cloth that has been in ice cold water over the face will work. The ice in the bag or a cold cloth will result in the human dive reflex. This is a physiological result similar to the bradycardic reflex used by marine mammals during prolonged submersions. In our case a plastic bag, similar to the one you use to put pathology blood tubes into was half-filled with ice and this was placed directly over the infants face and within 10 seconds the SVT had reverted. See below. In older children that can comply, a true vagal manoeuvre can be attempted. This may either involve the child putting their thumb in their mouth and blowing against it, increasing their intra-abdominal pressure, or they can have a large syringe and try to blow the plunger out of it. If a vagal manoeuvre doesn’t work then the next option is to use medications. The two we have at our disposal are Adenosine and Amiodarone. Adenosine has a very short half-life. We start with a dose of 0.1 mg/kg and increase it by 0.05 mg/kg to a maximum to 12-18 mg. Please be aware that this drug has to be given quickly because of its short half-life. The recommendation is that we have a larger bore cannula in the cubital fossa, lift the arm, inject the Adenosine and then rapidly inject a fluid bolus ie., 5ml -20ml depending on the patient of normal saline. Cardioversion should occur in a few seconds. Beware of the side effects of the drugs you are using. Although controversial in its use in accessory pathways, because of its potential to block the AV node and cause unhindered conductions through the accessory pathway, Amiodarone is recommended for use in SVT if Adenosine has not worked. In a study by Etheridge, SP et al (American Heart Journal 2001, January: 141 (1) 105 – 110), Amiodarone was found to be effective and safe for treating SVT in infancy. The doses are 25 mcg/kg/min for the first 4 hours and then 5-10 mcg/kg/min to a maximum of 1200mg per 24 hours.. If all else fails, cardioversion can be used. Verapamil should not be used in infants. It is contraindicated in children less than 1 year of age and is associated with hypotension and has resulted in mortality. What Do We Need To Worry About And What Causes SVT’s? One of our greatest concerns is Wolff-Parkinson-White (WPW) Syndrome. This accounts for about 20% of all SVT in children and carries a risk with it of atrial fibrillation with rapid atrioventricular conduction and ventricular tachycardia. For an understanding of the accessory pathways involved in WPW click here to go to a previously blog by Dr Kamalanathan. The first re-entry tachycardia is an AV re-entry tachycardia. In this form there are two pathways, one that passes through the AV node and the other one is an accessory pathway. When conduction is through the AV node, it is termed orthodromic and produces a narrow complex tachycardia. In a rarer form (15%), antidromic tachycardia conduction occurs up the AV node and down the accessory pathway resulting in a widened QRS. Findings on the ECG will include a very rapid rate and there may be abnormal P waves, i.e., inverted P waves. A second form of re-entry tachycardia that occurs is AV nodal re-entry tachycardia. Both pathways are in the AV node. There is a slow pathway which conducts antegrade and there is a fast pathway which conducts retrograde. The ECG findings in this type of tachycardia show a very rapid rate, P waves that may be retrograde in the inferior leads, or buried in the QRS or seen after the QRS as a pseudo “R” or S waves. Consultation with the Paediatric team and the Cardiology team is essential as some of these infants will need to be placed on medications such as Atenolol or Sotalol, and will need to be admitted. In older children there may be no work up at all needed. Paediatrics should be consulted. In infants especially if there are congenital abnormalities, cardiac abnormalities, signs of sepsis or any other comorbidities, the child will need to be fully worked up with full blood count, electrolytes, LFT’s, TFT’s and a full septic screen may also be needed. In our infant, because there may have been a fever a day or two ago, a full septic screen was performed. This will be guided by the Paediatrician and the Cardiologist. My rule is that infants of less than 3 months need admission. I usually try to extend this to infants of less than 1 year needing admission given there is about a 53% chance of recurrence of this arrhythmia in this age group and it can be caught early. If there are other potential causes or comorbidities, or the child is commenced on medication then these children should also be admitted. In all children with SVT, Cardiology follow up is essential. Examine the child fully, take the nappy off, look for fissures, or hernia, or hair torniquets, Examine for potential injury, listen to the heart and lungs, feel the belly, look in the ears, put some fluorescein in the eyes and make sure there are no scratches on the cornea and if nothing, put the child on the monitor.